LONDON--(BUSINESS WIRE)--Technavio projects the global heavy-duty pickup truck market to post a CAGR of close to 6% during the period 2018- 2022, in their latest market research report 2018. The increasing industrialization and urbanization is a significant driver that will impact the global heavy-duty pickup truck market growth during the forecast period. Transportation and logistics play a pivotal role in urbanization and industrialization. The commercial vehicle market serves as the base for global infrastructure development. The increase in construction, mining, and shipping activities has led to an increase in demand for heavy-duty pickup trucks. The popularity of electric vehicles has grown across the globe owing to the growing demand for use of environment-friendly transportation. Therefore, some OEMs are developing hybrid pickup trucks and all-electric pickup trucks. For instance, the Ford Motor Company has revealed its plans to launch F-150 Hybrid. The company also plans to launch 12 other electric and hybrid models in the market by 2020. This market research report segments the global heavy-duty pickup truck market by technology (non-electric and electric) and key regions (the Americas, APAC, and EMEA). In 2017, the global heavy-duty pickup truck market was dominated by the Americas with a revenue share of more than 85%, followed by APAC and EMEA. The market share of the Americas is expected to increase by a further 2% during the forecast period, while the other two regions will see a decline in their market share. 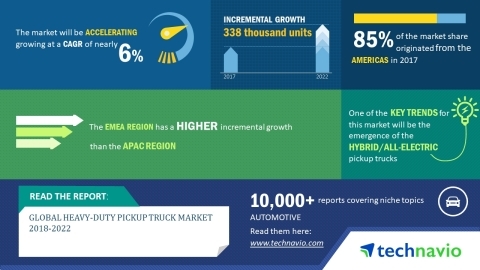 Technavio projects the global heavy-duty pickup truck market to post a CAGR of close to 6% during the period 2018- 2022, in their latest report.